An unexpected medical emergency or the untimely death of a loved one is devastating enough on its own, but the financial difficulties that often accompany these life-altering events can be borderline crippling. DonationTo makes it possible to avoid making crowdfunding mistakes such as only asking people to donate in person. Instead, you can harness the power of our online platform to reach out to people worldwide. Contributors can make an online donation 24/7 from any web-enabled device, and you will receive funding in real time. We also offer several options that will make it easy to steer clear of the common mistakes people make when raising money online. For example, our unlimited photo uploads will help tell your story, and you can easily share your page with our one click feature. Emily Ray Nardo spent her entire life battling with Ehlers-Danlos vascular syndrome, but this did not stop her from living life to the fullest. Emily was a wife, mother and dedicated friend to many people, and she selflessly put the needs of others above her own physical discomfort. Sadly, Emily passed away on November 4, 2015, at the age of 37. Although her husband of eight years knew that complications from Ehlers-Danlos vascular syndrome could eventually take her away from him way too early, this is still not the type of thing that any family with two children can properly prepare for. Due to this and the future needs of her children, Emily’s husband launched a memorial fundraising page. 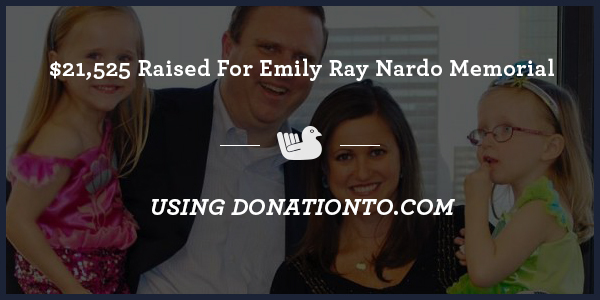 Emily’s children will be the recipients of the majority of the more than $21,500 that has been raised to date. The trust fund that has been set up in their names will make college a more attainable goal. Additionally, 10 percent of the money that is raised online will go toward the Ehlers-Danlos National Foundation in the hopes of helping find a cure for this medical condition. One of the biggest donation website mistakes is to lose track of the human side of fundraising. DonationTo is fully committed to helping people in need meet their financial and emotional needs. Because of this, we attach a comments section to each crowdfunding page. Every donor has the ability to leave some words of support along with their contribution. Comments of this nature can offer some solace to Emily’s family while they go through the grieving process. There are six different types of Ehlers-Danlos syndrome, and an estimated one out of every 2,500 people has some form of this genetic defect. However, the vascular version that Emily had is much rarer. In fact, only one out of every 250,000 people will suffer from this syndrome. Ehlers-Danlos vascular syndrome is characterized by fragility of the intestines, arteries and other internal organs. Patients with Emily’s condition face the risk of organ or arterial ruptures. Ehlers-Danlos syndrome is an inherited condition, so it is important for people to know their family history. The most prevalent symptoms of Ehlers-Danlos syndrome include skin that is really stretchy, joints that are overly flexible and skin that does not heal well after an injury. Emily’s memorial fundraiser could be particularly important for the future health needs of her children. Unfortunately, it is possible that one or both of them will develop Ehlers-Danlos syndrome. The good news is that this condition is passed on in its exact form, and the rarity of the vascular syndrome reduces the risk that either child will end up being diagnosed with Ehlers-Danlos syndrome. Avoid common fundraising mistakes by turning to an easy to use platform that makes it possible to collect donations online. DonationTo has partnered with WePay and PayPal for payment processing, and you will receive each donation in real time. This has helped Emily’s husband gather funding quickly, and your family can benefit from the same process. Instead of relying on in-person fundraisers, you can use online crowdfunding to reach out to people worldwide. Our site enables anyone with a web-enabled device to contribute 24/7, and we also give you the option to upload an unlimited amount of photos in order to bring your campaign to life.